Not everyone's interpretation of the English language is the same. Take the word "FAIR" for instance. We get a pretty constant stream of emails from collectors and non-collectors in the WWG inbox every week. Most from non-collectors are the typical "I got such and such bottle - how much is it worth?" Most of the novices out there could care less about the history of a bottle, they just want to know if they can make a buck on it. And most of the inquiries are answered with "since it has Federal Law Forbids Sale or Reuse of This Bottle, there's little to no demand at this time", it's pretty cut and dry. Once in a while though, one really takes the cake. We got an email a while back from an old guy. Years ago, he'd picked a AAA flask up out of the sage brush while hunting. He was trying to find a value online. The WWG popped up in his search, and he contacted us, hoping that he'd get an unbiased opinion. He asked what his AAA OldValley flask was worth. It was mint, crude, and a very good example. He wasn't interested in selling it but wanted it's value for estate purposes. I gave him the history about the bottle and provided the figures quoted in Thomas, as well as what they'd been selling for recently at shows. He also told me that a Craigslist ad also appeared in his online search from someone wanting to buy old bottles. What caught his eye was the photo of a clear flask embossed AAA in the ad. It read; "I will buy your antique bottles for cash - $100 (norcal)". He sent me a link to the ad. I pulled up the ad that he'd mentioned. It had pictures of a few bottles that popped up in the main window when you clicked on them. One line in the ad caught my interest. " Fair prices, quick response." I wondered, what exactly is a FAIR price? And what would this person base his idea of a fair price on? And so, we shot him off an inquiry. It read; "Hi. I saw your wanted ad on craigslist. I've got an old bottle (the Rosedale OK in the photo) that says the same thing as the purple one on the right side of your pictures. Only its brown instead of purple. It is clean and shiny and there's no cracks or chips. I'm sending along a picture of it. What can you tell me about it?" His response was somewhat generic; "Your bottle is a bit different, but from the same distributors. The one you have is scarcer than the one I have in my ad. 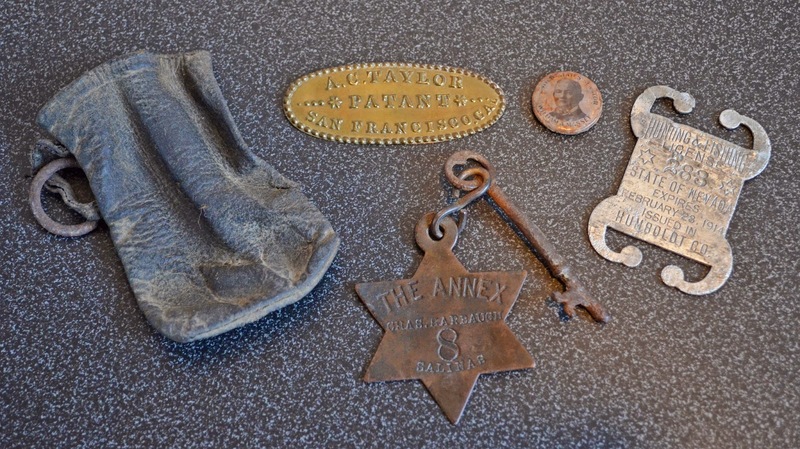 It is from San Francisco , probably 1890's or so. Very nice bottle. I would like to buy it, if you are interested. Let me know." We replied " Thank you for the information. If I were to think about selling it, what do you think that it would be worth?" This is his reply; "I would pay you $200 for it. Keep in mind that Thomas quotes a mid book figure of $2000.00. My experience with this bottle is in line with Johns. We opted not to reply. Sure enough, along comes another email from "SAM". "Any interest? Counteroffer? When questioned about his offer, and why he asked for a counter, he replied in part, "Well, a couple hundred dollars, ... , is considered quite good in the bottle world. Very few are worth much more and they are very scarce. Also, condition and color are everything in glass and bottles are no exception. The whiskey bottle, if absolutely perfect, with little or no surface scratches would be worth more. Quite some time ago I posted an article about labels. It was titled simply, "Paper". Toward the front of the article I wrote "Back in the late 1960's, just as whiskey collecting was emerging from it's infancy, labeled bottles were still somewhat available. Not plentiful, but we certainly saw a great deal more "back in the day", than we do now. 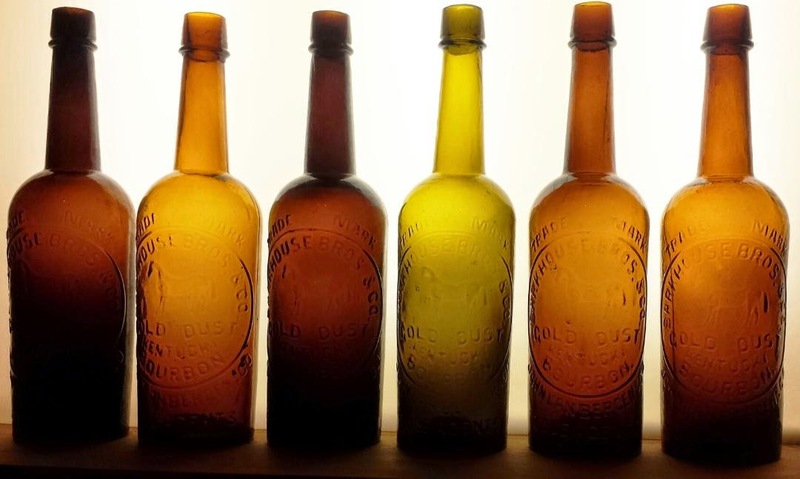 Sadly though, most collectors were either scraping or soaking off the paper labels so that the bottles would display better in a sunlit window or a lighted display case. So much for history..."
All cleaned up, it shined like a new penny. And you could really see the embossing, now that the dirty label and the cork with the antlers printed on it was gone. This part of the west has been noted for the abundance of western whiskies with antlers in the embossing. OK, so the cats out of the bag; it was indeed a J. Moore. Followed by a photo of the bottle, sans the cork and the label... with the crooked neck and spillover dripping nearly a half inch down the neck. It's a brilliant yellowish old amber that's so light that you can read a newspaper through.